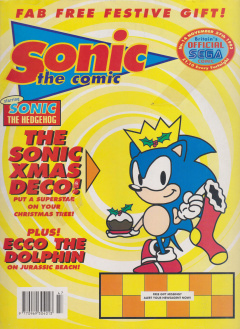 Sonic the Comic 14 is the fourteenth issue of the Sonic the Comic series by Fleetway Editions Ltd.
1 Sonic the Hedgehog - "Hero of the Year"
2 Ecco the Dolphin - "Ecco the Dolphin, Part 2"
3 Golden Axe - "Plague of Serpents, Part 2"
4 Decap Attack - "Starring Chuck D. Head! Part 5"
Sonic the Hedgehog - "Hero of the Year"
Ecco the Dolphin - "Ecco the Dolphin, Part 2"
Golden Axe - "Plague of Serpents, Part 2"
Decap Attack - "Starring Chuck D. Head! Part 5"